Today is an exceptional day in that it is sunny, the leaves of the proud Beech trees are dashed with all the colours of autumn and the air is unusually warm as it has been dragged all the way from Africa by a weather front says the lady on the telly. Today, we are breathing African air. It’s still early: 7:30am. I was just on the shed roof changing some of the tiles but have refrained from hammering them down yet. I don’t think the neighbours would appreciate it, especially Becky next door who is three days overdue with her baby. A baby which incidentally they are going to call Jamie. Unfortunately, I can’t claim credit, they just like the name. I will wait until 9am to start the hammering, I wouldn’t want to disturb baby Jamie’s beauty sleep in his mothers belly. So where are all the sand and ice sculptures? It is October, my dormant period, and the time when I do wonderful things like tax returns, the ‘dark side’ of my job. But then it has been a very busy summer. Travel to Holland, Germany, Finland, Wales, and all over England. My pride and joy however, was my sculpture that I made in the town of my birth, Bradford. A grand sculpture of Charles Darwin and the decent of man. A little controversial, but the city of Bradford took to it well and there is no other place that I would have rather done it, and right in front of our marvelous Townhall as well. 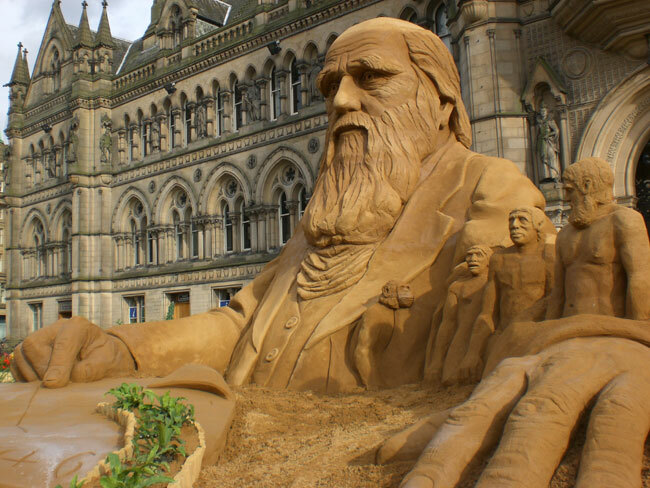 But then it couldn’t have been done without the ever so talented Nicola Wood, and the infatiguable support of James Haigh, Sparrow the God and Kymm Edwards; the champions of sand sculpture; and I cannot forget to mention Uriah Woodhead who gave us all the materials for the project. 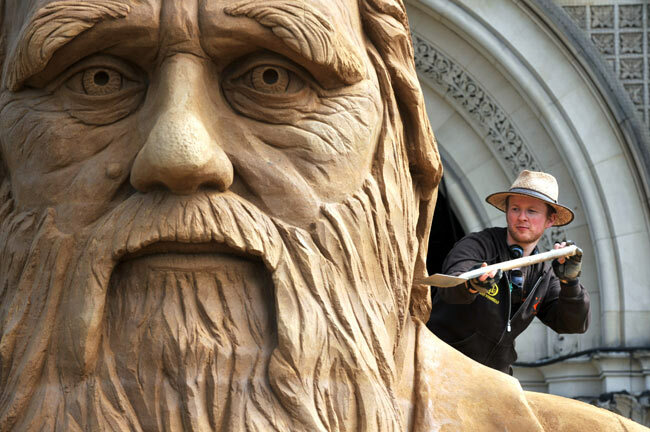 aberration films made a fantastic film of the making of the Darwin sand sculpture. No Lad, I couldn’t have done it without Nicola Wood, Nicholas Braine and James Haigh. Top team!